The story: Hannah and Tom meet at Cornell University when he mistakes her for her roommate in the middle of the night. Hannah maces Tom in the eyes with Eternity by Calvin Klein and they are BFFL ever since. It’s now 10 years later, they’re living in New York, and they’re just as tight as ever. Tom (played by Patrick Dempsey) is a wealthy, heartless womanizer and Hannah (Michelle Monaghan) is a loveless art conservator geek. She says “I love you” too much and he has a bizarre need to only say those words to strange dogs. He’s been with so many women but Hannah has never been one of them. She’s his best friend and that’s good enough for him. Hannah, meanwhile, seems to have hidden feelings for this man-child but Tom is oblivious. It’s a 6 Made of Honor is nothing near genius, but there’s something about this little story that pleases me. Perhaps it’s the Scottish scenery that woos me, or the lead characters, or the humour in watching Patrick Dempsey hanging with the girls as he carries out his MOH duties? The movie should have spent more time up front developing Hannah and Tom’s friendship, and I wish Tom’s moments with the dogs didn’t feel so obviously plopped in just to build the theme. But still, I refuse to abandon it. I think it’s cute, even though critics have not been kind (it received a 13% on Rotten Tomatoes and phrases like “bonehead plot” have been thrown around like wedding confetti.) Several of my girl friends, however, have watched Made of Honor and enjoyed it. It’s not a movie you should buy to own, but it does make a good cheapy weekend rental. The envelope, please Made of Honor should win a prize for Most humiliating attempt to win back a girl. Patrick Dempsey in a mini kilt with white briefs underneath. I needn’t say more. Sweet extras The scenery is worth the watch. Fiancée Colin lives in a Scottish castle and the last third of the movie takes place here. It’s actually the beautiful and haunting 13th-century Eilean Donan castle, which rests in the Scottish highlands just outside Dornie. 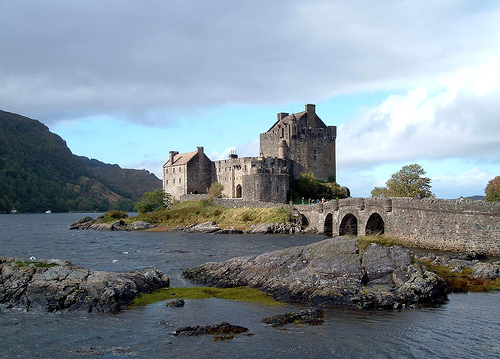 The Eilean Donan castle was also featured in several other films including Highlander (1985), Elizabeth: The Golden Age (2007), and the James Bond film The World is not Enough (1999). Interior castle shots are a mishmash of other locations, including Dunvegan castle on the Isle of Skye. Good for who? Watch this movie if you like Patrick Dempsey, wedding-related rom-coms, or the sublimity of castles by moonlight. 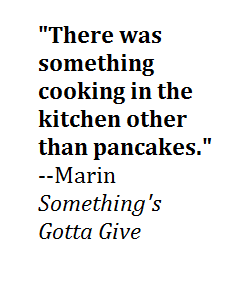 But watch out: there’s coarse language and sexual references scattered steadily throughout. Don’t even bother inviting the Baptist minister’s wife over for this one because just when you think you’ve heard the word “balls” enough, you’ll hear it again. I suppose if one doesn’t like the movie, one could make a drinking game of it? The movie is rated PG-13 for language and sexual references. Here’s a full breakdown of the content on Screenit.com’s review of the movie.